The HMS Endeavour was sailed to Australia by Captain James Cook and his crew well over 200 years ago now. The ship and the intercontinental mode of transport in general were featured in these year 4 students’ studies. 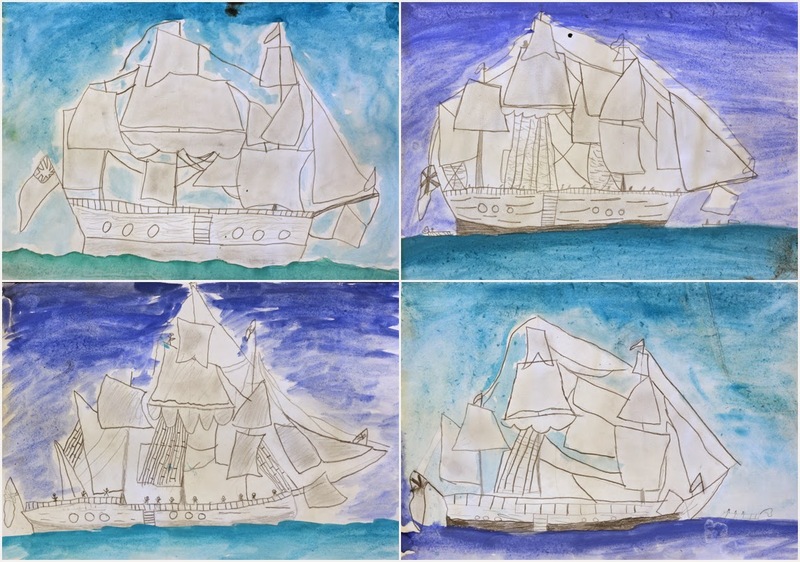 Together we embarked on the challenge of sketching this tall ship. I initially lead a guided drawing lesson which the students then completed themselves and later embellished with some simple watercolour ocean and sky. Those are really impressive. I love the look of line with wash. Thanks Hope : ) Yep I like the contrast between them. Beautiful project! I love the shades in the sky and water and the precision in drawing the boats! Can you please post a step by step tutorial on how you drew the ships?